Sodexo, the corporate giant that holds ownership over the cafeteria and the Tim Hortons on KPU’s Surrey campus, has again fallen under fire for failing to satisfy some of the university’s students and faculty. An advocacy group founded by five youths in the criminology program—and overseen by their instructor, Jeffrey Shantz—is now running a “Hangry Students” campaign to urge KPU to stop putting all its eggs in Sodexo’s basket and shift its focus towards student-oriented food security on campus. Sodexo has provided services to a wide array of clients ranging from universities to prisons, and has been the subject of controversy for the better part of a decade. Although the company itself is French, it operates all over the world. Sodexo has been boycotted several times in the United States and protested nearly everywhere else they have served, almost always on university campuses, and always for the same reasons—unfair pay and labour practices for their workers, investment in the prison and armed forces industries, poor food quality and, occasionally, the odd customer abuse accusation or string of horse DNA discovered in their beef products. Seven years ago, Sodexo staff made local headlines by chasing KPU criminology student Emery Warner off campus for handing out pamphlets condemning the company’s ethics and operations. The ordeal attracted media attention all over the city, but other than that, little came of the dispute. Shantz says that he still sees student interest in the company brought up consistently in his classes, and has continued to encourage his students to look into issues regarding Sodexo’s presence on campus as part of their criminology class curriculum. A year before Warner’s altercation with Sodexo, KPU was looking to replace its then food service provider, Chartwells, and began a bidding process to bring in a contractor “with proven experience, capability and capacity to develop and provide a comprehensive food service program for a multi-campus post secondary institution.” Although the call-out document listed one of the contractor’s requirements as being able to “effectively and efficiently provide an affordable, quality and appropriate menu and service for Kwantlen’s cafeterias and catering needs,” and makes no mention of student-run or local businesses being either banned or encouraged from applying, Shantz says that the student body and faculty were not alerted of the open bid. The application form for interested contractors included a list of references, answers to questions about company history and experience, and information about KPU’s campus customer base and facilities. Sodexo won the bid and has been the primary food service provider for KPU’s Surrey campus ever since. Now a group of passionate students are standing up to the company to demand better standards for the hungry on campus. 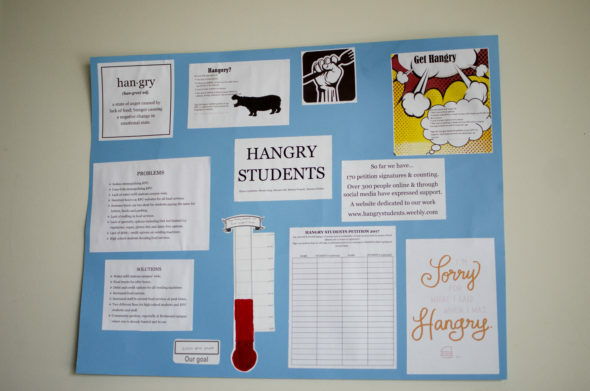 Alyssa Carpenter, Rhoda Fong, Satnam Gill, Michael Pincott, and Ximena Poblete – all students of Shantz – together make up KPU’s “Hangry Students.” Their demands, although plenty, can reasonably be summarized as getting student access to healthy and affordable food around the clock. 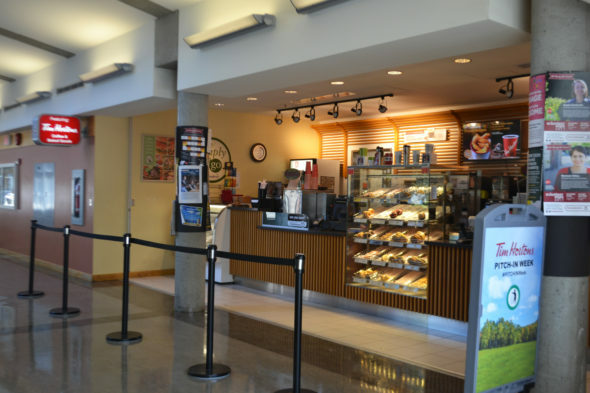 Of the three food service providers open to students on the KPU Surrey campus, two are owned by Sodexo. The student-run Grassroots Cafe offers healthier options, but charges much higher prices than either the cafeteria or Tim Hortons, which often closes before the sun goes down. Those attending classes anytime after 5:00 p.m. are frequently left either to go hungry or eat from vending machines until their instructors excuse them. The lack of culinary variety is particularly problematic for anyone on campus who has dietary restrictions. For community members eating vegan, vegetarian, halal, and so on, grabbing a bite on campus on a budget or after dinnertime can be nearly impossible. Because the contract between Sodexo and KPU has not been made public, whether or not the cafeteria must remain open during particular hours is uncertain. The Hangry Students group suggests that, if is unable to stay open longer every day, the university should consider running external programs for local businesses, food trucks, and KPU students—such as those from the KPU farm school—to sell and give away their products. This would not only boost community involvement and businesses, but also provide more variety to KPU students who don’t have the time, money, or ability to run across the street to get acceptable food between classes. Personally, she and Fong would like to see a company other than Sodexo “taking that space and making it feel like it’s more for students,” as compared to the impersonal service they feel they receive in the cafeteria. “It almost feels like I’m in a hospital—the quality of food, and the employees there. I’m not saying they’re bad people, but they’re so phased out. It’s like, ‘Okay, here’s your food, go.’ They treat us as if we’re just profit and someone to take money from,” says Gill. Though unrelated to Sodexo, another issue that concerns the Hangry Students is the lack of water fountains on KPU campuses. Shantz says that building plans he and other faculty members were sent included spaces for water fountains, but they were never actually constructed. Instead, there are vending machines selling Coca Cola products around nearly every corner—a fact that Shantz, Fong, and Gill suggest may be a strategic symptom of the university’s exclusivity agreement with the franchise. Despite the lack of KPU-installed water fountains, the Kwantlen Student Association has set up water bottle refilling stations on-campus to keep the community hydrated and environmentally-friendly. Fong notes that refilling reusable water bottles is “better for the environment and it’s healthier for students, instead of being forced to buy a vitamin water, which is actually still pretty unhealthy, or Coke or iced tea.” She suggests that the university install more fountains in its buildings, seek out a more student-friendly provider, and negotiate a new contract with Coca Cola as soon as possible. Evidently, Coca-Cola was chosen as the provider on June 10, 2010. “It would create a more tight-knit community as well, to know we can provide for ourselves and provide our own resources,” she says. When asked to comment on the opening bid and direction that the university plans to go in, KPU President Alan Davis replied that, although he is “open to the conversation” around Sodexo and whatever may replace it once the bidding process begins again, he wasn’t certain of “where [KPU was] at in respect to the bid for space” at this time. 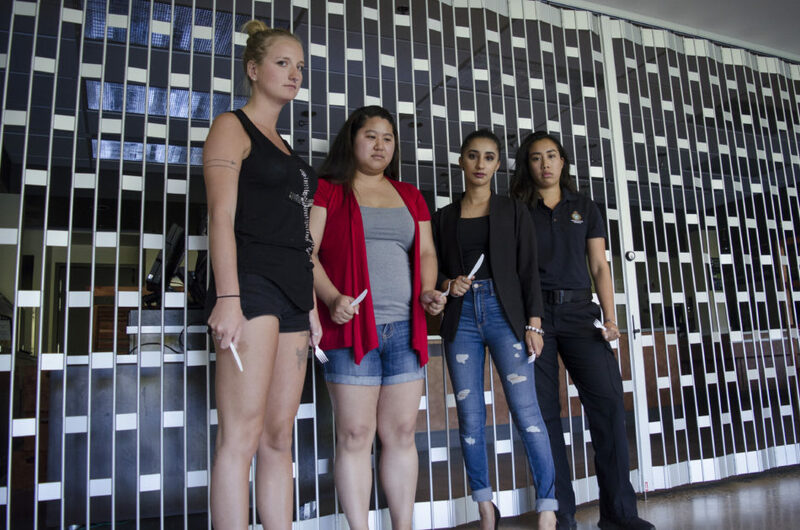 On Aug. 24, Fong wrote in an email that the Hangry Students were able to meet with Stefan Durston, KPU’s Director of Ancillary Services, on Aug. 22. Although the students have not yet heard from Sodexo, they hope to meet with a representative of the company as well as the Kwantlen Student Association in the near future.